We started this day bright and early by going strawberry picking. Halfway to the farm (a good 30 miles away) I realized I was supposed to ping a friend to see if she wanted to go with us. Sorry, Sue, if you're reading this! I totally spaced! Anyway, we were brought via hayride to a field that had not yet been picked this year. How awesome. We hardly moved, and yet we picked 17 pounds of strawberries. They were beautiful and large and tasty! After returning from the fields, we had strawberry doughnuts and headed home. I had to stop at the store to get sugar, and a few other essentials, and when we got home I got to work. Strawberries to eat - the ones on the top of the heap, the least crushed. 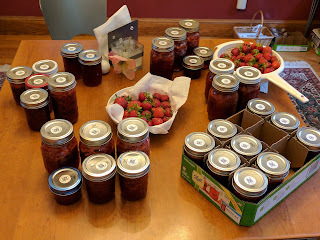 Strawberry jam - 9 cups. Strawberry rhubarb jam - 1 pound of rhubarb and 2.5 cups of strawberry purée - 8.5 cups. Strawberry soup - 1 quart of berries, 8 ounces of cream cheese, some mango juice drink and some honey. That was lunch. 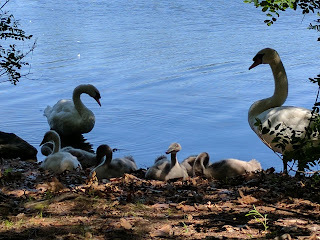 At this point, we went out for an hour long canoe trip in the local pond. They only started renting canoes and kayaks on the weekends last week, and since we have an ambitious canoe trip ahead of us, I wanted everyone to get some practice. Strawberry Maple Smooch - kind of a strawberry maple syrup thing for cakes or ice cream or pancakes. Strawberry Jalapeño jam - 4 cups strawberry purée and 1 cup diced jalapeño peppers - 7.5 cups. Strawberry Lemon Marmalade - 7 cups. I still have about 1.5 quarts of berries left for something. I plan to make strawberry pancakes for breakfast. I am setting aside 2 jars each of the plain strawberry, the strawberry rhubarb and the strawberry jalapeño jams for the fair. I may change my mind, but at least I've got some things to enter. And, I have to make burgers for dinner. But I'm taking a break. It's only 5:30 pm. The strawberry jalapeño jam won third place at the fair!